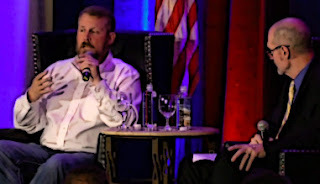 Editor's note: Below are the video and transcript to Mark Geist's live interview with Truth Revolt editor and Shillman Journalism Fellow Mark Tapson at the David Horowitz Freedom Center's 2016 West Coast Retreat. The event was held April 8-10 at the Terranea Resort in Palos Verdes, CA. Mark Tapson: I have the distinct privilege tonight to share the stage with one of the heroes of the 2012 Benghazi attacks and the coauthor of the book "Thirteen Hours." How many people here have either read the book or seen the movie "Thirteen Hours" or both? Okay, pretty good. I strongly recommend both. The book is a page-turning thriller and the movie is one of the best action flicks ever, and I'm a big action movie fan, but both of these have a key difference in them and that’s that the events that they depict were real and they were as serious as a heart attack. And that adds a very affecting emotional dimension to both reading the book and watching the movie, so I recommend them both. I hadn't met Mark Geist until this evening when I came down for dinner, and I spotted someone who looked like he knows 19 different ways to kill you with his bare hands. And then I realized, "Oh, that's Louie Gohmert." But then I looked slightly to the right and I thought, "Oh, there's a guy who looks like he knows 20 ways to kill you with his bare hands," and that was Mark Geist. After talking with Mark a little bit beforehand, I realized that he and I have a lot in common, actually. First of all we're both named Mark, which I consider very significant. Second, he is a highly trained elite warrior who went from the U.S. military to a clandestine operation protecting American covert intelligence operations in one of the most dangerous hot spots in the world. And I too am named Mark. So, that's about the extent of it. And I say that not to just make a self-deprecating joke, but to highlight something that's very apparent about Mark Geist when you either read the book or watch the movie, and that is that Mark and his brothers in arms are a breed apart. To paraphrase George Orwell or supposedly George Orwell, they are the rough men who stand ready and enable the rest of us to sleep peacefully in our beds at night. As much as everyone would like me to continue talking I'm going to bring Mark Geist up now and have a chat with him. So, please welcome Mark Geist. Let me begin by taking the liberty of speaking for everyone here when I thank you for your service in the Marine Corps. Mark Tapson interviews Mark "Oz" Geist from DHFC on Vimeo. Mark Tapson: Or as our president would call it, the "Marine Corpse." And thanks also for your courage under fire in Benghazi and for risking your life to do the right thing. Mark Geist: Thank you very much. Mark Tapson: Thanks also for coming here to talk with us. Mark Tapson: Let me get started with a question here. Let's start at the beginning. How did you wind up in Benghazi and what is your background? How did that bring you to being in Benghazi in 2012? Mark Geist: I think for me it all started -- I had a grandfather who was one of my inspirations. The person I looked up to. He was a tank commander in Patton's army going across Europe. Had five purple hearts. He never really talked about what happened until the day I got home from boot camp and then that's when he would talk to me because I didn't rate getting talked to about what happened until then. I don't know if I still rate. I think what they did was a wonderful thing and going through that because it's not like it is today. He got injured, he'd go to the rear and then he'd get well enough to go back and just do it all over again. Now we don't really -- I mean we do that if it's minor injuries, but major injuries you're going home. But then I had three uncles. One that was in the Marine Corps for ten years from 1958 to 1968, did two and a half tours in Vietnam. Another uncle that did 28 years in the Navy and another uncle that did four years, so that sense of service, I'm not sure it's genic or not. I believe it is, honestly. That sense of service its bred into you or we just know what we want to do. When I was young, when I went to kindergarten I think it was, my mom had bought this little book. It had a little folder in it you put your school picture in and then on the back it said, "What do you want to be when you grow up?" and it had for boys and for girls. You could mark either a dentist or a doctor and then on the other side it had soldier or fireman, and when I was in kindergarten I wanted to be a soldier. And all the way up through probably fifth grade I was either a soldier or a fireman or a police officer. Luckily I've gotten to do all of those throughout my life. I've got those checked off my bucket list, but that took me in when I grew up in a small town. Six months before I graduated a friend of mine came up and said, "Hey, you want to join the Marine Corps with me?" I'm like, "Well, what are we going to do?" He's like, "We're going to go jump out of airplanes. We get to shoot things and all of that." I'm like, "I'm in." All my teachers at school were like, "Thank goodness. So we don't have to have him back next year." Now they knew that I was going to go somewhere and they didn't have to worry if I was going to come back. So I went into the Marine Corps ten days after I graduated high school and it's just been a wonderful ride and a wonderful career ever since. I did 12 years in the Marine Corps. Started out in the infantry. I worked as what in the Marine Corps we call a "STA platoonist," surveillance and target acquisition. It's snipers and battalion reconnaissance, and then I was a counter-terrorism instructor for about four years. And then I lateral moved over to be an interrogator/translator, and the Marine Corps sent me to school to learn Persian Farsi as a second language. I got out of the Marine Corps because I was gone all the time. I was married. I had a young boy about a year-and-a-half at the time. I decided I got to do the family thing and keep the marriage together so I got out. I become a cop. Got divorced anyways. That takes you away just as much as it does being in the military, but you're home and being away, which was even harder for my first wife to understand. I was a cop for six years and then I got kind of bored with that. Not enough excitement in my life, so I started doing bounty hunting and I thought that would be fun. So I figured now I can go kick down people's doors in civilian clothes and see if I can get them to go back to jail, take them back. But that was kind of -- some months it was diamond, most months it was coal. So when the work kicked off, I just had this real passion to get back into it and serve. I still have that sense of service, and I think that's one thing that all military guys have. Everybody that serves in the military has that sense of service. That sense of purpose when they're serving this country, and when you get out you miss that. You don't have that, and a lot of people struggle with it, and I think that's one of the things. It's just not a PTS -- I don't call it "PTSD" because it's not a disorder. It's just post-traumatic stress. We can all get it from a lot of different things, but a lot of our soldiers and sailors and airmen and Marines battle with that sense of service after they get out, and I think that's one thing the contracting thing did for me is it allowed me to get back into it. Serve with my brothers, and I got back over into Iraq in 2004 and pretty much in and out of every country that has "-stan" at the end of it for the last 30 years. Mark Tapson: What prompted you to go to Benghazi though? How did you end up specifically there doing that security work? Mark Geist: I'd been in a couple other different countries; Pakistan, like I said, anything that said "-stan" after it pretty much. I had been in that country, and when they came up and it was like, "Hey, we need people to go to Benghazi," and it's like there was every place we'd go when we were -- I was with GRS, it's called Global Response Staff, and every place we were stationed at was because it was dangerous. Very dangerous. But Benghazi, it was new. It's that Wild West, and it was one of the worst ones. So it's like, "Hey, I want to go there." That's just where I wanted to go. When Syria started opening up, that's where I put my bid in to go there because, I don't know. I can't explain it. I just like going to those places that people love me so much. Mark Tapson: So not only did you know what you were walking into, you sought it out. You were eager for that. You were looking for that. Mark Tapson: Okay. What was the security situation like in Benghazi when you got there? When you and your team got there. Mark Geist: To kind of paint the picture for you, you have a city of approximately 150,000 people. There was probably ten-fifteen different militias that were vying for control. You would have one militia that controlled the airport. You would have another militia that controlled the sea port. Another one, the truck traffic. I think the only thing I can really compare it to here in America was how the mafia tried to control things back in the 1920s. Just different groups trying to control this and some of them were sophisticated, and then they would recruit just like ISIS does today. You've got a percentage of them that are very sophisticated, and then they recruit. The majority of the people they recruit are very unsophisticated. They go in and they say, "Hey, here's $50,000.00. I need your sons to come fight for us." And their sons are willing to do that because there's five, or six, or seven of them, and this is a great place to go and earn martyrdom for the family, so generations will sing songs and talk about them, and the family's taken care of by earning that money. So a lot of them, that's what they're doing. They're going to join that militia to fight. And some of the militias were quasi-friendly The one that the State Department, and me and Tonto and Tig always joke is probably the worst outsourcing ever done in American history was the State Department outsourcing some of their security to the February 17 Martyrs Brigade. They were the actual militia who started the revolution, and it was February 17 when the revolution started, and that's how they got their name. And it was just a conglomeration of people that came together to fight under that banner until Kaddafi was gone. Because when Kaddafi's there they had to calm an enemy. "Now that he's gone, then we get to fight for our each individual little piece of that pie." Mark Tapson: When you were there in Benghazi, you and your brothers, your fellow shooters, as you called yourselves, Kris Paronto and Jack Silva and John Tiegen and D.B. Benton and Tyrone Woods, the team leader, you were there to protect what they call the compound and the Annex. Can you describe that, like how that works, how close those two are to each other and what the security situation there was like? Mark Geist: We were about three-quarters of a mile apart, and to kind of tell you a little bit of the difference between the two of us is the six of us that were with GRS or Global Response Staff worked for the Culinary Institute of America or better known as the CIA. Our job was to protect case officers when they went out in town so they could worry about doing their job and we would take care of the security part of it. And between the six of us we had over 100 years of experience doing counter-insurgency operations around the world. One night were talking about it and probably close to 80 different countries between the six of us we'd all been in. That's just what we were drawn to do, and the State Department had five diplomatic security personnel. They call them DS or "diplomatic security" officers, and talking with them, the best I can guess is they had about 20 or 30 years of experience to protect an ambassador. They were on a compound that was eight acres in size. Our compound was about the size of a football field. We had to run around the inside of it five times just to make a mile, to kind of give you an idea. If in the movie you see James Dale Badge, who portrays Tyrone Woods, pulling around that tire, that's exactly what we did. We had a toe strap that we'd hooked to that and we just went around dragging that thing for exercise because it wasn't very big. You didn't have a lot of space to do that. We were about three-quarters of a mile away as the crow flies, so anything that was happening over there like the night of 9/11 we could see the fire. I could see the reflection of that and the smoke coming up and the tracers flying across the night. As the guys were sitting there chomping at the bit to get out there while Bob kept telling them to stand down or to wait, which I guess is just a matter of semantics. Telling you to wait or stand down is pretty much the same thing in our eyes. Mark Tapson: And Bob was the CIA, the local CIA chief there? Mark Geist: Yeah, he was what we call the "chief of base," so he was the guy that was in charge of our base, the annex for Benghazi, and then his boss would be the chief of station. Mark Tapson: How was the GRS team perceived by people like Bob and the other non-shooters as you call them there? Were they grateful to have you guys there and have their backs? Mark Geist: On 9/13 they were. Most of them were. It all depended on the different places. I've worked in a bunch of different places and some of them, the guys you worked with were just really thankful. They used our skills. They knew what we had, and they knew what our capabilities were, so they would utilize that as an asset. Then you had those -- we'd joke about it, but those ivy leaguers that thought they were Jason Bourne. They go to school. They go to the farm. They come off the farm and they watch Jason Bourne and they're going to save the world. They're going out there. They're altruistic. They want to do their job. They want to be that spy that's going to find that one asset that's going to give them the guy that found that information that got that guy that led to Osama Bin Laden. They want to be that guy. That's the essence of guys in security. If I've been doing a protection detail, whether it's overseas in Iraq or if I'm doing it here in Hollywood, for security, me and that individual I'm protecting always have conflict because their job is to get out there and see people and be exposed, and my job is to keep them from being overly exposed, so that threat doesn't get there. As security officers, you're going to always have that conflict. Mark Tapson: Your buddy, Chris Paronto, says that Bob considered you guys basically glorified Walmart security guards, initially. Mark Geist: Yeah, Kris or "Tonto" in the movie, Tonto and Bob had a unique relationship. It was kind of like water and oil or water and gasoline. They just didn't mix well. Mark Tapson: Well, the book is obviously about not just you, but your coauthors and your cohorts too, but what happened to you specifically on the night of the attack? Where were you when you discovered something really serious was going down and how did you respond? Mark Geist: Me and the female case officer were out for, I guess, easiest way to explain it is we went out on a dinner date and we met a local Libyan couple and went for dinner at their house to kind of have a discussion. When I got a call about half-way, two-thirds through it on my cellphone, and Tyrone called and said, "Hey, you need to get back to the Annex. Just stay away from the consulate," and he called on an open source or an open line cellphone, which is an unencrypted, unsecured device. So he wasn't going to say anything more than that, and I knew if he was going to call and interrupt a meeting or interrupt a dinner date then there must be something really significant. So I had to get the female case officer and kind of break her away from what she was doing, talking with them, and again that's where that security -- I'm worried about security. We need something to do. I'm not going to say what's going on in front of her because I don't need to let anyone else know, and I have to encourage her in a very polite, but forceful manner, to get into the car. When we get into the car we're heading back and we turn on the radio, and that's when we start hearing what's going on over at the consulate. And you hear somebody come over the radio and they're setting the buildings on fire. You can hear when they key the mic to the radio. You can hear the gun fire, the machine guns and the explosions. Then all the sudden they come over and they say, "If you guys don't get here now we're all going to die." They used a few expletives in there that we can reserve, but you could hear that passion and that desire, that fear that they thought they were going to die. It was at that time that the car I was going in probably went from about 80 to 120 mile an hour and the female case officer, she started talking too much, trying to tell me what to do and that we need to do this or what do you think about this, and I just kind of looked at her. I'm like, "Hey, you know you need to shut up. You're in my world now. I need your eyes not your mouth. I need you to be looking for what's the threats out there." Because that's what she would be good for right then. I can't see everything. She can cover that side of the road, and if there's a threat I need to know it. And we made our way back to the Annex. When we got back to the Annex, the guys at the Annex had already left because they heard that same thing of if you don't get here now we're going to all die. That's why after having three stand down orders they didn't even ask for permission after that. They just jumped in the vehicles, and the guy at the gate opened it up and they just headed over. Mark Tapson: I'm going to get to the stand down order in just a minute, but first let me ask you. Did you ever hear anything prior to the attack about the locals protesting a blasphemous YouTube video regarding Islamic prophet Mohammed? Did you at any time feel like the attackers were just locals motivated by this video or was it your sense immediately, I mean at the time, that at least some of these guys were literally terrorist and that it was a calculated attack? Mark Geist: That's a loaded question, but you're right. It's obvious. Mark Tapson: Just from your perspective. Mark Geist: I've been in and out of the Middle East for 30 years and I've never -- well, I can't say never because that's too – 99.9 percent of the time I can say I've never seen a protest at night because it kind of defeats the whole purpose being dark because a protest is to get attention drawn to you, not to be hiding. They didn't have signs, they weren't chanting. They brought AK 47s, RPGs and machine guns instead of signs and chanting and bullhorns. So it's pretty obvious what it was. In October, about mid-October I got out of the hospital and I was able to see some of the footage from the security cameras, and from the drones overhead and you could see the guys, who they were, and you could tell -- I mean anybody's that been in the military knows a guy, how he carries a weapon. How he walks. What he's looking for. If he's trained or if he's not. So that was easy. There's no way it was a protest. Mark Tapson: Let's talk about the stand down order. Tell us about that. You received a stand down order from Bob, right? The CIHE. Mark Geist: Yeah, and it was the five guys that were at the Annex because I was out in town at that time, but they're the ones who actually got the stand down order. Mark Tapson: Do you know if that was Bob's decision or he was relaying something from higher ups? What did he say if anything about that? Mark Geist: He never really quantified why he did that, but from our experience -- and Tig had the most experience dealing with Bob at least in country because he was on his fourth trip to Benghazi. When we say a trip, a trip for us is usually about 60 to 70 days, so Tig had been there since 2011 in and out. He'd been in Benghazi for three different trips and Bob was always that way. In the movie at the very beginning when you see Jack and Roan get caught at that checkpoint and have to talk their way out of it and Bob wouldn't let the QRF, which is the Quick Reaction Force, go, that really happened. The only difference is it happened at night and it was Ansar al-Shari at checkpoint, who are the same terrorist organization that attacked us on 9/11, and they held them there for about an hour-and-a-half, not just 15-20 minutes. Our job as a QRF -- and this is where I don't know if it was lack of trust or faith or not knowing what the capabilities of the asset were as our QRF. Our QRF was only a two-person team, but their job was to get within -- so that checkpoint where they got held up was about 30 minutes away. Thirty minutes is a long fire fight and a lot can happen, so as our QRF I may just get in the area and hang out and see what happens. I'm not going to go in there and kind of escalate things. I'm just going to sit there and get close enough where if I'm needed I can be there. If I'm not then I can just disappear into the shadows again. Mark Tapson: So once you did get back, take us through the night from your perspective. What happened to you and what you did. Mark Geist: Like you said, our compound, we had our front gate and it was really difficult. Our front gate, there was a main road that came in front of it or a paved road, but there were walls in every compound overseas. At least in the Middle East, every house has a 12 foot wall around it. A big metal gate that you have to come in and out of. So that would have been on the south side. Our back gate was on the east side. On the east side there was also a house, and it's depicted in the movie very well where there were some kids there. They would always come over and throw firecrackers over the wall just to kind of – they loved to harass us. I think they were terrorists in training. Then behind us was a, I guess the closest thing would be like a feed yard or a stock yard for sheep, which about three days before they had brought a couple hundred sheep in and then put them in the pens, and it was getting on towards Eid. Eid is when they're going to do the great big sacrifice. Everybody comes and buys a sheep, takes it out and sacrifices it. They were getting ready for that. After everyone got back from the consulate the guys had went over, had pushed off about 40 personnel because there was about 40 enemy personnel that took over the consulate area. The five guys, Tig, Tyrone, Jack, D.B. and Tonto, had moved in two different elements. Three guys in one element. Two guys in the other with some of the Feb 17 guys kind of tagging along were able to push over 40 guys off the consulate and take that back over. And when they did that that's when they started searching for the ambassador. The buildings there had already been set on fire and, to kind of paint the picture, if in a building this size or this room, everything from about here up was just black smoke. You couldn't see the end for your riffle. So Tig and Tyrone are going in and out of this building looking for the ambassador because Jack and Dave Ubben had gone in and they had been able to find Shawn Smith's body, and they had brought him out. So the only one we were looking for, the only person unaccounted for, was the ambassador. And this was about 10 o'clock by the time they got onto the compound. They had done that several times. A counter-attack came from the back gate of the consulate. They repealed that counter-attack. They got word that there was over 100 people massing outside, so the decision was made at that point, and this was about two hours later. We haven't been able to find the ambassador. We don't know if he's still in the building or if they maybe had kidnapped him. So, we've got five of us here because the State Department security personnel had left to get back to the Annex, and they had to make the decision to either fight off a hundred people or make their way out. So they make their way back to the Annex at that time. When they got over there we kind of heard a lot of the people – well, the State Department guys when they went out the front gate we had told them to go left and they ended up turning right because that's kind of their muscle memory. They always went that way to come to our location. Well, unfortunately, I would say three compounds down, there was an Al Qaeda safe house, and we found out about it that night. We knew that. They like to fly that black flag all the time. They drove past that house and that's where the attack had came from. And they got ambushed there. Luckily they were in a fully armored Level 6 Toyota Land Cruiser, which, by the time they got over to the Annex, it probably had a couple hundred bullet holes in it; they had got shot up. Our guys, when they went out instead of turning right they made sure they turned left and came back, and they were pretty much unaccosted. We started setting up our defensive positions and filling in all the holes there when the guys that followed over, the State Department guys, started coming up on our northeast side. They were going to come in and breach our back gate, and at this point we knew that most people in Libya didn't know who we were. They knew, of course, that this blonde-haired, blue-eyed gringo was – I'm not going to hide, I'm not going to blend in as a Libyan -- but they thought we were Westerners from Europe and no use giving them any reason to think otherwise. But as they're coming up, we let them get fairly close, probably within about 25-30 yards, and one of them threw a bomb over the fence, and it’s a gelatina bomb. I saw it coming over the fence and it landed in between me and Tig and blew up. Luckily, it didn't have any shrapnel and that's what initiated the first fire fight. There was pretty much a probe. They were coming in, they were trying to shoot out our perimeter lights. There was myself and Tig. He came up and jumped up beside me. I was in the northeast corner on the tower. Tonto and D.B. were up on top of what we would call Building B, so we pretty much had them in a crossfire. Really there was four of us. There was probably 10-15 of them, and they were kind of outnumbered, so we pretty much made short work of it. I don't mean to sound crass about it, but it was – you know the midway game that you play at the county fair or whatever, that's whack-a-mole. That's what it was like. One of them would stick their head up, you'd shoot them, he'd go down. So it just happened real quick. We were done in about 10-15 minutes, and they were pulling their dead back and their wounded, and they kind of fell back. This was getting on to about 1 o'clock when we heard that the – we had a support team that was coming down from Tripoli and that was Glen Doherty, or "Bub" was his call sign, and that group. They were able to acquire, rent, lease or whatever, a civilian aircraft from somebody. This is where several times throughout that night we all feel, at least I know me, Tig and Tonto -- and we know the other guys do as well, but I'm speaking for them because I've heard them talk about it -- we know God's hand was in on this because there's six of us and throughout the night there was anywhere between 15 and 50 attackers at one time. The six of us, we were able – and it wasn't all six of us engaging at one time. Like when they were attacking from the northeast side, there was four of us against whatever number that was. So we know that there was a greater power providing their protection over us that night. Mark Tapson: But you guys had also discussed this very security scenario beforehand in the time long before the attacks. You guys talked over various things that might happen. Mark Tapson: Including a mass attack on the compound. How well did that serve you? Talk through that. Mark Geist: In the Marine Corps, when I was a staff sergeant, I used to train my guys and it was you got your six P's: prior planning prevents piss poor performance. You've got to talk things through. We war game things. If we can't actually go through the motions with it, if we've got 10 minutes down time on a wet board, we may just draw the compound and say, "Okay, hey, if this happens what are we going to do? Okay, if they do this, what's going to happen? If they get over our walls, what's going to happen?" So we all know without having to get on the radio and say, "Hey, I'm going here" or "you're going there." It just happens. It’s a smooth-oiled machine. What helps with that is again, it's the experience that we've all had working in the special-ops community. Having that military training of the initiative, that never quit, that always driving forward and being the best that you can be. Quoting the commercial, but that's what it is. That's how the military trains you. That's how the good instructors, the good platoon commanders, the good platoon sergeants, they train their guys to always prep for the unknown. The six of us had never worked together before that time period there. Me and Tig had been there about a month, a little bit more. The rest of the guys had been there about, I think 70 days. They were extending to get there a little bit longer. Doing those things kind of really helps, and there's really lessons to be learned for businesses and organizations along those same lines. Always knowing how you're going to deal with an adversity that comes up within your business ahead of time. Thinking about that forward. Then you know how to deal with it. Mark Tapson: As the night went on, and help was not coming, what did you think was going to happen? Did you think, we can keep this up for a while, we can hold them off for a couple days if we have to, or did you think this is it, we're eventually going to be overwhelmed? Maybe by morning or noon or something if we don't get help. Mark Geist: No, there's no way they were going to take us over. We knew we had plenty of ammo because I think we had roughly, I don't remember the exact count, probably 30,0000 rounds between the six of us, so there was like 30,000 of them that could have came. We might have missed a couple times. Mark Tapson: One shot, one kill? Mark Geist: Yeah. We had just gotten a food shipment in like two days before, so we knew we'd have food shipped in about every two weeks. So we were good for a couple weeks. The only thing we didn't have was protection from indirect fire, which would be like artillery or mortars or that stuff that comes down from the sky and that happened. Mark Geist: Yeah, when they were shooting out the lights and I didn't get to see the outside. I talked to a guy that had gotten to get back to Benghazi later after 9/11 or 9/12 even and he asked me, he says, "How did you guys even survive that?" because the wall that we were standing at, me and Tig were standing at, was just pockmarked with bullet holes. When one of those hit, some of either the cement or the lead off the bullet had hit me across the nose. Another piece had ricocheted and hit Tig in the side, but it was just a minor flesh wound, so not too bad. Mark Tapson: What about when the mortar hit? Tell us about that and the aftermath. Mark Geist: We'd had two attacks at our place. The second one we'd had about 20 or probably twice as many people as the first one. Probably 20 or 30 people. They again came exactly the same way. We were able to repel that one. That one lasted probably 15 or 20 minutes and then things got real quiet. It was getting on about 2 o'clock in the morning. It was about that time that we had gotten information. Somebody called and said that the ambassador was at the hospital. What actually happened is, one of the neighbors after the fires had burned down -- and at that point was when there were looters on the consulate grounds. They had been able to get back into that building, and they found that the ambassador had kind of been trapped in between his bed and the wall, and they pulled his body out. When the neighbors saw it, he knew who he was, and liked him because Ambassador Stevens was loved by the majority of the Libyans in Benghazi, most of us were. If they knew that we were Americans, they'd come up and they want to give us tea, and these are the people that are just your everyday people. They're the ones that are like all of us in here that go to work every day, that have kids that are going to school. They're the shopkeepers and the store-owners, and those people love that America came in and got rid of Kadaffi. But there was a power vacuum left and that's when the evil people came in and formed up the militias. They're always going to find that. They're going to take advantage of those situations. So the guys from Tripoli had made it into the airport. They were trying to make their way into our place. And I had moved from the location I was at; got up on the roof where Dave Ubben was and Tyrone were. The rooftop was about 40 by 30 feet, and Dave Ubben was on one side, me and Tyrone were on the other. It was kind of quiet, and things were slowing down. The tempo was down, so you're just talking about what's going on. Me and Roan were talking about our kids because he had a, I think it was a 16- or 18-month-old baby boy. My little girl was 7 1/2 months at that time. Tig's twins, a boy and girl, were two weeks older than my little girl. Tonto had two children that I think were like six and eight, and Jack, him and his wife had two boys, and they just found out that day that his wife was pregnant. It was surprising that there's that many little kids between the six of us. And then Tyrone looks at me and says, "Hey, Oz, these are some of the best warriors I've ever fought with," which really meant a lot to me because this is coming from a guy who has over 20 years in the Navy SEALs, in the SEAL teams, not just in the civilian. This is when we've had ten years of war. So you knew he was very experienced. And I'm like, "Yeah, these guys are great," and you've seen it. You just know those guys that have that mettle that you know are going to be there no matter what. It was about that time the guys from Tripoli showed up. They were able to bribe one of the local militias to drive them from the airport to our compound. The guys from Tripoli showed up. They came inside, and Bub, Glen Doherty, instead of going inside under the safety of the building, he came up on the rooftop. He was the only one that came up on the rooftop of the 67 guys that come down, and he came up there, wanted to say "hi" to Tyrone. See if there's anything where he can lend a hand. And I'd never met Bub before, so Roan says, "Hey, Oz, this is Bub. He's a sniper from the teams." That's where we worked together, and we've worked in Beirut together as well. I'm like, "Well, it's been quiet, so hopefully we ain't going to need you, but morning's coming on, so at least having another riffle up here is going to be a good thing." He had turned and walked away from me, and he walked to my left and then around to the back, and that's when a mortar or a rocket hit the back wall, which was an RPG small arms fire; opened up and a mortar hit the top of the wall. When the mortar hit the top of our outer wall, Dave Ubben, who was to my right about 30 feet-40 feet over, screamed out that he was hit. I glanced over and he was to the east of me, and you could see that blue haze as the sun's getting ready to come up. Right before the attack came morning prayer was going, so the big speakers from the minarets were – the imam is sitting there shouting, "Get your lazy butts in to the mosque so you can praise God" or whatever they were going to do. Right before the attack it just all went quiet. Again, possible indicator that that was the initiator for the attack. With Dave Ubben getting hit and being a small team, we all know that I can't stop shooting to go help him. He's got to take care of himself, and the fact that he's yelling out tells me as a teammate two things. That his heart's beating and he's breathing, so I know he can take care of himself. That's just how it has to be because if I stop then that's one less gun shooting bad guys and then the bad guys overrun us and we all get killed. You have to have that mettle in you that if you get injured you got to take care of yourself first. Ty had a machine gun, a belt-fed machine gun, and he comes up, and as he says in the movie, his word was laying hate. Normally if you're going to fire a machine gun, a belt-fed machine gun, you're going to do three round burst. We call it a FPF, "final protective fire," because how many people were shooting at us and to me it was like a sprinkler just mowing down the grass. He just pulled the trigger and was just back and forth like this where they were shooting at us. I was shooting my assault rifle and then the first mortar hit on my right-hand side about 15 feet away and blew up. I was in the middle of changing my magazines. It knocked me back, and as I stood up -- the building's over there, every building -- if this is the rooftop there's a wall around the top of them about 33 1/2 foot tall. You are using that for cover. I'm raising up in a crouched position starting to shoot and as I do I see Tyrone's in a fetal position at my left and my feet and his guns gone. He's not shooting, so he's out of the fight. I turn back to start shooting and as I raised my left hand up I realize that from about 6 inches above the wrist its hanging off at a 90 degree angle. Going through my mind is, I just got to get back in the fight. I got to get my gun back in and I got to start shooting cause there are people trying to kill us. I keep trying to swing my arm up there, trying to grab ahold of that gun, and it's just not working. That's when the second mortar hits just about 5 feet-7 feet short of the first one on the rooftops, which actually would have been the third mortar. So the third one hits and I take a quick glance back and I see Glen go straight down on his face. At that point I wasn't sure if he had just fell down to take cover or if he actually was killed. I turn back and bring my gun back up. I'm trying to reengage and again I can't get my arm to work. Can't get my gun to work because I didn't know it until after the fact, but my gun was pretty much destroyed by all the shrapnel. That second mortar peppered me again with shrapnel, and then shortly after that the last mortar landed and again it hit me with more shrapnel, which the best way I can describe it is it felt like I was getting stung by a thousand bees. Being stubborn I was going to stay there in the fight, but after the last one I figured if there's going to be a fourth, it's probably going to take me out, so I better get to some cover. I dove down to the ground and just got real close to the wall and the ground as far as I could, and everything just went quiet. There was no more fire and no more mortars, so I sat up, and first thing I did is I just felt something wet underneath me. My first thought was I'm bleeding out, so I start reaching in my med bag that I carry on my side, and pull out a tourniquet, and then I realize that what I'm sitting in wasn't warm. It was cold. So it must be something other than blood. What it was is, they have water tanks on every building because it causes you to have gravity flow water, so you have water pressure in the house. And that thing had gotten perforated. They're plastic and they get perforated by the shrapnel and flooded the top of the roof. I got distracted again thinking of – I quit worrying about myself and started thinking about Tyrone, wondering if he was okay, so I reached over before I got the tourniquet on -- and part of it was shock -- and I reach over and grab him and try to check for a pulse, and that's when I see a shadow come up over top of the rooftop. And that was Tig. Tig comes up over. First person he runs into is Dave Ubben. And Dave Ubben has shrapnel in his face, up above in his sinus cavities. His left arm is almost blown off like mine and his left leg about 6 inches above the ankle is almost severed as well. Tig being the first one up there, being in total disregard for his safety. The debris, all the dust and everything still hadn't settled by the time he was up there, and he got two tourniquets put on Dave Ubben. Come over to me and saw me sitting there against the wall trying to put my arm back in place. Tells me to quit playing with it. Grabs the tourniquet. He gets the tourniquet on me and he helps me stand up because I know he still has two other people up there he needs to tend to. He's like, "Hey, can you get over to the ladder?" And I'm like, "Yeah." So I start walking over to the ladder and that's when two more guys come up on the rooftop and they're like, "Hey, can you get down off the ladder by yourself?" And I'm like, "Well, I know I need to." Going through my mind is I have to because I know they need to take care of Ty and Glen. I climb up on the box, step up on the side of the wall and sit down, and then the ladder is just like an inch-and-a-half square tubing that we welded together to make a ladder and just leaned it up against the building. I'm sitting there and I'm thinking, I just survived three mortar attacks. Now I'm going to try to get down here by myself. I'm going to fall, break my neck and end up dying that way. And I'm like, that's going to be bad because you don't want to die that way. I'm a warrior. I want to die a warrior's death. They're going to go home and tell my kids, "Yeah he survived mortar attacks, but he fell and broke his neck because he's clumsy." I reached and hooked my good arm around the top rung of the ladder and I just swung my feet around and tried to land them on the ladder, but Murphy's Law; it's not going to happen. So I caught myself with my good arm, pulled myself back up, got situated on the ladder, climbed down, walked down around the building, ran into another guy that was coming out who walked me inside and laid me down on the floor. Then he left and went back up on top of the roof to get the other guys down. And while I'm laying there all the case officers, the CIA guys, are standing there. The female, that was – she was there, and they'd turned off all the lights inside now because after the mortar attack they didn't want the door to open and inadvertently let him know where we were at. Which I'm thinking well, they already know where we're at, they just hit four mortars within a 30 by 50 foot square area. So they knew where we were at. So there's eight sets of eyeballs sitting there looking at me and with flashlights and I'm like, "Hey, somebody get some shears and cut my clothes off because I know I'm bleeding from more than just my arm." None of them moved. They're just all looking at me in shock and I'm like, "Somebody get these --" and the only person that jumps to it is the female that I was with and she runs into the med room. I can hear her going through stuff, and all the sudden she yells out, "Oz, where's the medical shears?" There in the first set of shelves, third one from the top, and I knew that because again it goes back to training. Those key things that you want, those key pieces of equipment. You always put them in the same spot so you always know where they're at. When it goes back to muscle memory, when you need something, you know where it's at. She grabbed them. She comes over and she starts to cut my clothes off. About that time the deputy chief of base pulls out his big old buck knife and says here let me help. Again, I'm sitting there thinking -- this guy's shaking, he's shaking like crazy -- I'm thinking he's going to end up stabbing me and killing me with a knife. Now I survived a mortar. I survived not falling off. Now this guy's going to end up killing me. There's another great story for my son to tell, right? Mark Tapson: So they were all in shock but you weren't? Mark Geist: Yeah. So she ended up cutting my clothes off. We ended up finding -- I got hit in the neck. Had three holes in chest. Another went in near my femoral artery. I think they counted 30 holes. Most of them weren't bleeding so bad, so it wasn't too awful bad. The biggest one was the neck one. We got that one taken care. About that time is when they brought Dave Ubben down. Mark Tapson: And then after all that, you eventually boarded the plane also out of Benghazi on your own power and said "I walked into this country." Go ahead. Mark Geist: They were going to carry me off. I made it to the airport in the back of a pickup truck on a gurney, and then they came over and they were going to try to carry me on the airplane. And before they could even get that, I was like, get out of my way, you know. I walked into this country; I'm walking out. I'm not going horizontal. I'm going vertical. In the plane that we got, that they brought down was a commuter jet basically. It was a small, or a very large Lear jet, or small commuter jet. There was a pilot and copilot, and then there was a flight attendant. This Arab lady. And as I'm walking up to the airplane I'm pretty buck naked, bunch of blood just dripping off me. Holes all over and her eyes are about size of saucers. I'm not sure if that's because of the blood or because she saw a white guy naked. As I'm walking up, I climb up the stairs, she just disappears to the back of the airplane. I turned the corner to walk down the aisle, I see her running back to the front and she has a hand full of towels, and I'm thinking, okay, well now I can cover up a little bit and all of this. Well, she doesn't hand me the towels. She starts laying them down on the floor because she's afraid I'm going to bleed on her boss's airplane. She doesn't want to worry about cleaning it up. I go back. I lay down. They bring Dave Ubben in. And Dave Ubben, he's like 6'4", 235 pounds, and they have to break out all the pretty cabinets and stuff just to get him in because he can't walk on. We get him on, get everybody loaded up. We head to Tripoli and get to Tripoli about an hour an half – two hours later, and the first lifesaving me and Dave Ubben had was by Libyan doctors in a Libyan hospital. Mark Tapson: Let's talk about the movie for a bit. The book took no creative license, and my sense of the movie is that it took very little also, if any, creative license. Do you feel like Michael Bay, the director, really captured the truth of that night of the attacks? Mark Geist: He did. We had the chance at the very beginning to meet with him and we meet with him in Miami. He has a house out there. We happen to be out there and set up a meeting. Me, and Tig, and Tonto sat down with him. He's like, "I really want to do this. I want to bring this out and this and that." I just interrupted and said from the very beginning, I said, "You know, I know that you're going to have to change things. You're going to have to take some creative license with it because we got an event that lasted 13 hours and you're going to have to put it into two. The only thing I care about is if you bring any disrespect to any of the four dead then I'm just going to beat the living crap out of you." He says, "Well, you don't have to worry about that." I'm like, "I know. I'm not going to worry. You need to." I think he respected that. That is a true story and he understood how passionate we were about that and he wanted us to understand how passionate he was about getting it right. He told us a little bit later his mom had told him don't do this movie. It's a time bomb with all the politics involved and that, and he's like, "No, you've got to read the book mom. You've got to read the book." The only person Michael Bay listens to other than Michael Bay is his mother. He got her the book. She read the book and after she got done with the book she says, "You know Michael, you need to do this movie." They did a great job. We were involved in it. They sent us the script. Let us read through the script. There were some things we didn't like. We changed them. They were okay with that. We did set design, involved with the architects in designing the set to make sure it was as accurate as possible with the limitations they had. When we went back onto our compound it was like walking back into Benghazi. They just shrank it by about 20-25 percent. The consulate was a little bit different just because the area that they had to work with. So things were just a little bit different with the roads and everything, but it was accurate. The events themselves were all accurate. Everything that you pretty much see in the movie happened in real life. The only big explosion that didn't happen in real life was when the bus -- after the second attack, they're bringing that big bomb off the bus and that thing gets blown up. Michael Bay had to have a big explosion. It worked. It kept to the spirit of the book. Mark Tapson: Well, speaking of politics, when you saw Hillary Clinton tell Congress "What difference at this point does it make?" about what happened in Benghazi and why, what did you think about that? What went through your mind and what would you like to say to her maybe if you had the opportunity about that. Mark Geist: I got to see the whole thing, so I got to actually see it in context, so it wasn't as raw as it was where the news media, they took that in sound bite and made it how they wanted it. Mark Tapson: What? The media never does that. Mark Geist: Yeah, I know. But even then you would think that someone as experienced as Hillary Clinton with dealing with the media, dealing with Congress, would know better than to say those -- just saying those words no matter what context you meant them in was disrespectful. And I think me and Tig and Tonto are very close with Tyrone's mom, with Shawn Smith's mom, and I think that's what hurt us the most. I know for me, what angered me the most was the fact that it's being that disrespectful towards the family members of those that died. Mark Tapson: Okay, one last political question. I understand that you recently endorsed Donald Trump for president. Publicly, you endorse him. What is it about Donald Trump that earned your support? Mark Geist: Because they called me up. I got to meet his son, Don Trump Jr., at a hunting convention. Just one of the things that, because I always knew that seeing Donald Trump on the Apprentice, and all of those things. He's crass. He's brazen. He's rude. He's socially unacceptable at times. He says what's on his mind and so that's what I was expecting from his kids. And when I met his son, we were sitting there talking and his little daughter had came up and tugged on his jacket and said, "Hey dad, I want to go buy this," and he's like, "Do you have your money?" She's like, "Yeah." He says, "Okay, how much is what you're buying?" And she says it's about $31.00. He's like, "How much do you have?" And she's like, "I got $35.00." He's like, "Then that should cover taxes and everything, but before you go buy that, is that really what you want because you are going to be broke after that and you're going to have to earn your money again." And the fact that he would use that as a lesson to teach his daughter about how to spend money and do that, he learned that from somebody. He didn’t just come up with that on his own. He learned that from his dad. After I got done with that I started thinking this is probably why he is a billionaire because he knows how to manage his money and he teaches it to his kids and his kids teach it to their kids. About two, three weeks later they asked me if I would be interested in endorsing Donald Trump. And I'm like, "I'm not going to endorse him unless I get to talk to him. I want to look him in the eyes and see if he's going to lie to me." I went out to Las Vegas and I got to meet him and talk with him twice while they were doing the convention or the caucus out there, whatever they were doing, and I sat down with him and talked with him. He's not the same person when you're sitting in front of him, talking with him like that because I think when the cameras run, he's a showman. He knows how to work a room. He knows how to get a response out of people, and that's what he's looking to do. It's smart business. He's been able to stay in the front of the media without having to spend any money on the media. He didn't need to pay to get a commercial because they gave him a commercial and how'd he do that. He did it by saying what drew a response from everybody and it was calculated. Just watching him and how he did it, because I got to be around him a good part of that day, and he's very calculated in everything he does, and I think that's because he's a great businessman, and I believe that he'll put the right people in place. He knows that I think from being a businessman that to be successful you have to have good people underneath you. That you can't be the only person in the room. Even if you're going to act like it. And I think those are the traits that I saw in him that really pushed me into doing that, and the other side of it is I think he's different. He's not going to be the same one. The establishment has not stood behind us in the last four years since they've taken over and they haven't stepped up and had the courage to do what's right, which goes back for me. It’s a personal thing back to Benghazi. We had the fortitude and the courage to do what needed to be done because there were Americans lives in peril, so it's irrelevant what's going to happen to us. We went over and we saved their lives. In doing what we did, in defying those stand down orders, there was more than two dozen people that lived that night. Had we not done that or had we not been there, it wouldn't have been four dead. It would have been 30 dead, And why don't our politicians have that same courage, that same fortitude, to stand up whether it's going to mean getting elected or not and doing what's right? Not doing what's easiest. Mark Tapson: I think that's a good place to stop. Mark, thanks very much. Mark Geist: Thank you everybody. Thank you very much.